Newington proudly provides exceptional sports facilities for our boys here on our grounds. Newington boasts one of the best boatsheds in Australia located on the picturesque Hen and Chicken Bay. The boatshed has a boarding facility for 20 senior boys to allow them to train, study and sleep over a couple of nights a week throughout the season to minimise disruption to their school program and necessary sleep. Players have the privilege of training and playing at excellent onsite facilities that attract professional circuit players such as Samantha Stosur, Casey Dellacqua and Rennae Stubbs. The courts have a world class Australian Open 10 layer surface (the same surface as at Homebush Olympic Park). All venues and facilities are also available for hire during school holidays. 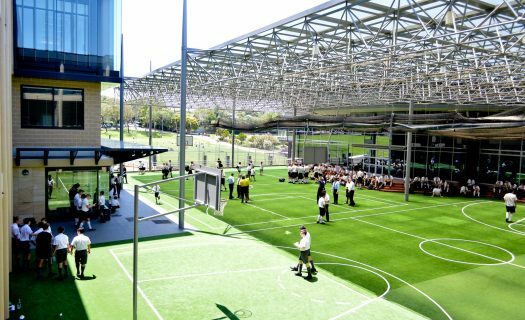 Newington has a number of sporting facilities both onsite and offsite. We have regular hiring agreements with Marrickville Council and other private sporting facilities.